The effects of climate change are increasingly upon Viet Nam, especially in the southern provinces. Nowadays, unlike in the past, at the end of May the climate in the region changes abruptly from hot and dry to very wet; the heavy rain is accompanied by thunderstorms and even hail. This year has killed shrimp on 10,000 hectares in the coastal provinces of Ca Mau, Soc Trang, Bac Lieu, and Tra Vinh. 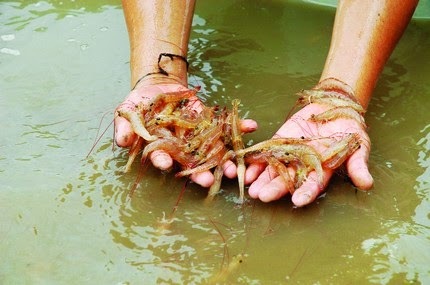 "Last year 50 per cent of shrimp in Vinh Chau District, Soc Trang, died, causing a loss of VND110 billion (US$5 million)," Hai Nhiem, a local farmer, was quoted as saying in Sai Gon Giai Phong (Liberated Sai Gon) newspaper. "This year we prepared very carefully but still lost 1,600 hectares." Shrimp die of many causes like poor breeds and environmental pollution, but the major reason is drought. In all coastal provinces like Ben Tre, Tra Vinh, Ca Mau, Bac Lieu, salt level in sea has been recognised to be higher than the same period last year. Especially, in Ca Mau, salinity level grows up to 30 per cent. The situation has caused the lack of fresh water and huge impacts to daily life and agricultural production. In many places people are forced to buy a cubic metre of fresh water for VND200,000. According to the Ministry of Agricultural and Rural Development, more than 100,000 hectares of cultivated land are threatened by saline floods now. Every year around 1.7 million hectares of land are threatened in this manner. By the end of this century average temperatures in the region might rise by 1.3 - 2.8 degrees Celsius, rainfall by 4 - 8 per cent, and sea levels by 66 -99 cm. And for every metre rise in the sea, 39 per cent of land in Mekong Delta will be flooded, seriously affecting 35 per cent of the population. The Mekong Delta, the main rice, seafood, and fruit producing region for the country, is also the most vulnerable to climate change. There are many plans to mitigate and cope with climate change, and most delta provinces have carried out projects, but they are not concerted and are instead mostly disjointed. Concerted action is a crying need as are more studies to carry out comprehensive planning for the whole region. The role of protective forests is very important in coping with climate change but it has not been paid enough attention. Recently thousands of mangrove trees were cut down in the Con Nang protective forest in Cau Ngang District, Tra Vinh Province. It made locals furious since mangrove forests help keep out the sea, prevent landslides, are a source of oxygen, and provide shrimp and fish a good habitat.